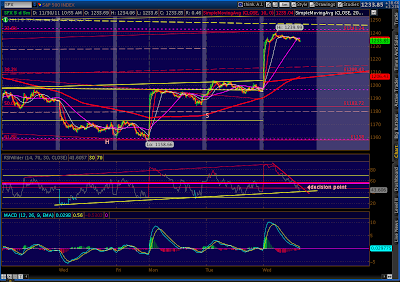 We headed back up and are testing this morning’s high of 1239.99. I would typically expect some negative divergence to set up before calling this the top. 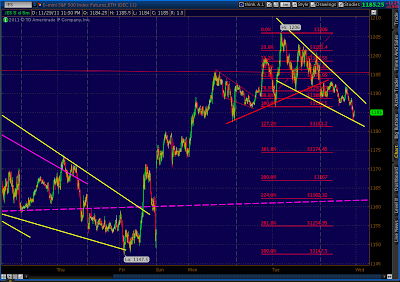 Profit taking wouldn’t be a terrible idea, especially as much of the action has been in the overnight futures lately. On the other hand, I think there’s at least some more short covering to come. 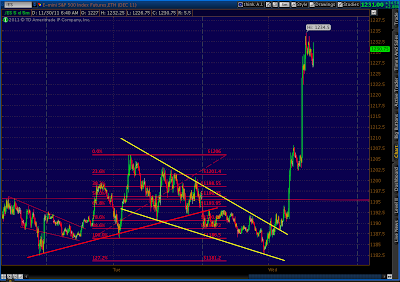 We successfully broke through the red trend line, confirming the bounce off the longer-term yellow line. This was followed by a backtest of both. Market should return to 1238-9 and retest the day’s highs. 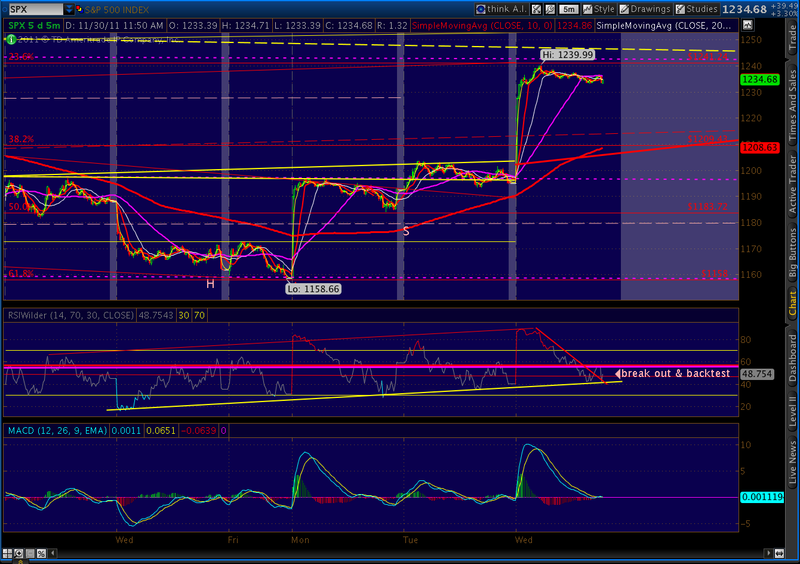 We’ve reached a decision point, as illustrated on the 5-min chart’s RSI trend lines. The bottom yellow line has stopped 5 declines in a row. 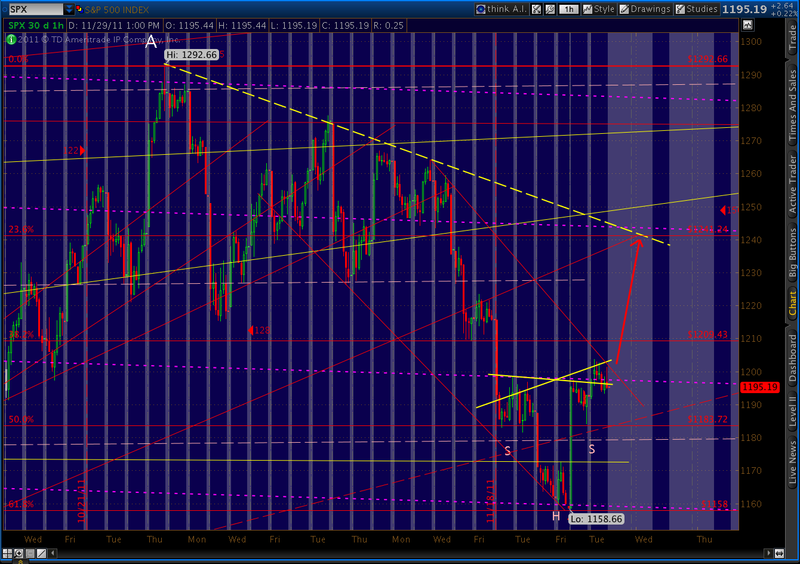 If it’s to be 6, the market will have to rally through the red trend line. It seems pretty likely, in hindsight, that the ISEE Sentiment Index spike I mentioned below was probably the result of all the financial system insiders who were privy to the central bank news doing a little insider trading. To bulls, this announcement is mother’s milk. It’s the ultimate solution to too much debt — create more debt! Time, now, to analyze the deal, see how much oomph it really packs. Who would be surprised if it was like so many past announcements — all hat and no cattle? 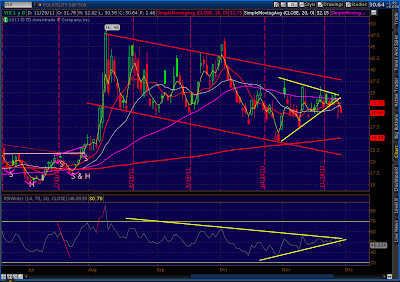 The RSI trend lines I discussed last night are playing out nicely. RSI has blown through the lesser thin red line (Point 2) and is making a bee line toward the longer-term purple TL at Point 1. The next test is whether it stops there, setting up a lower high, or it has the strength to bust through. As we approach it, the trick is to shift to the 5, 15, and 60-minute charts for a sneak peek. 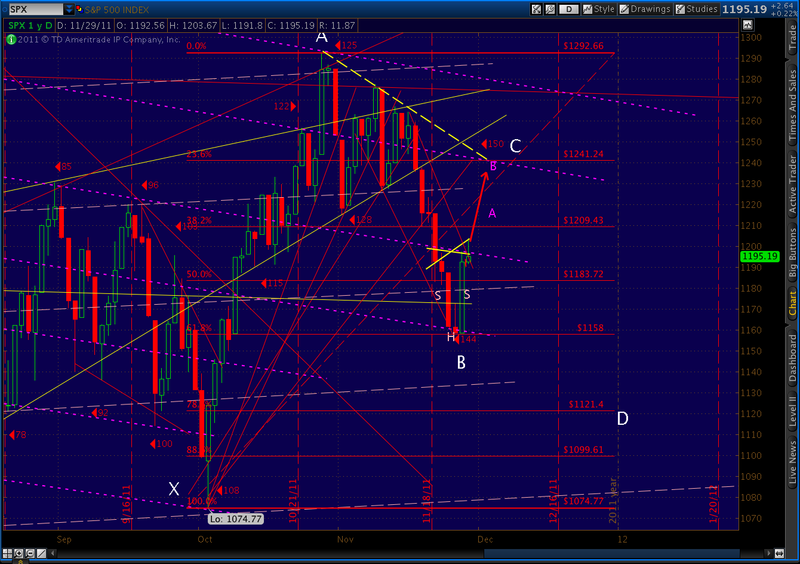 In the meantime, 1241 is the next logical rally target. As discussed the past few days, it represents the .236 Fib level, a TL off the recent highs, one of our parallel channel lines. 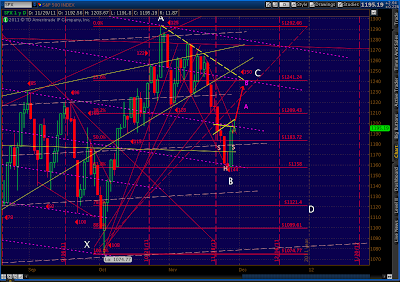 And, it’s only 3 points beyond our Inverse Head & Shoulders target of 1238. “Picking up pennies in front of a steam roller” is the expression, meaning here pursuing small profits at the risk of being creamed by a larger trend. We’ve spent a lot of this past week talking about potential upside targets — whether we might rebound to 1215, 1241, 1265, 1307, etc. before getting on with a rather nasty downside scenario. But, let’s be clear that the potential 100 points of upside is nothing compared to the downdraft to come. There are some very good arguments for a little higher bounce this week: the gap to fill at 1209.43, room to run in the daily RSI, EW 2nd/4th wave alternation, the inverse head and shoulders pattern, a better-formed harmonic (Gartley) pattern. There is also a perfectly good case to be made for the downturn to start right here, right now: the underlying economics, Europe, the bank downgrades, Fitch’s negative outlook, the 2008 analog, a competing negative RSI trend line, etc. Those who wish to squeeze the very last nickel out of this rally might be rewarded by being patient a few more days. Otherwise, it’s time to start considering short entry points. 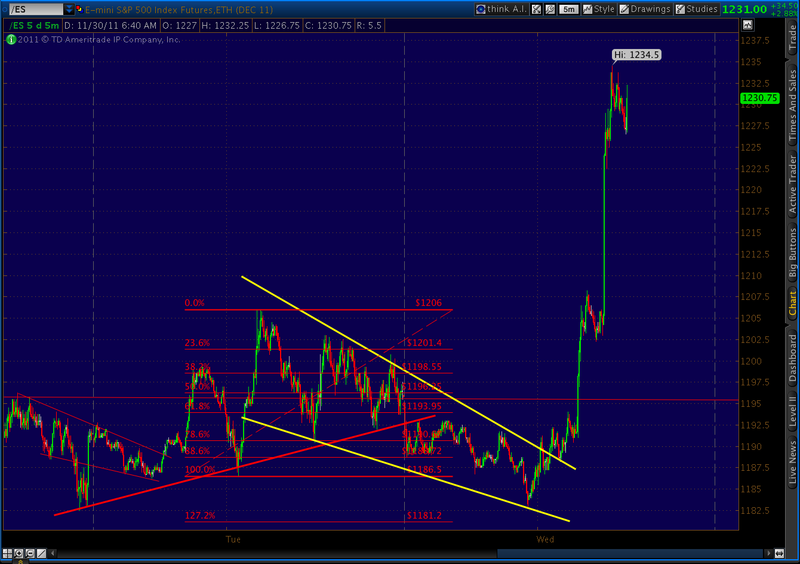 Here are a few of the charts I’m watching. First up, the IHS target which coincides with a TL off the recent highs, one of our parallel channels and the 23.6 Fib at around 1241. 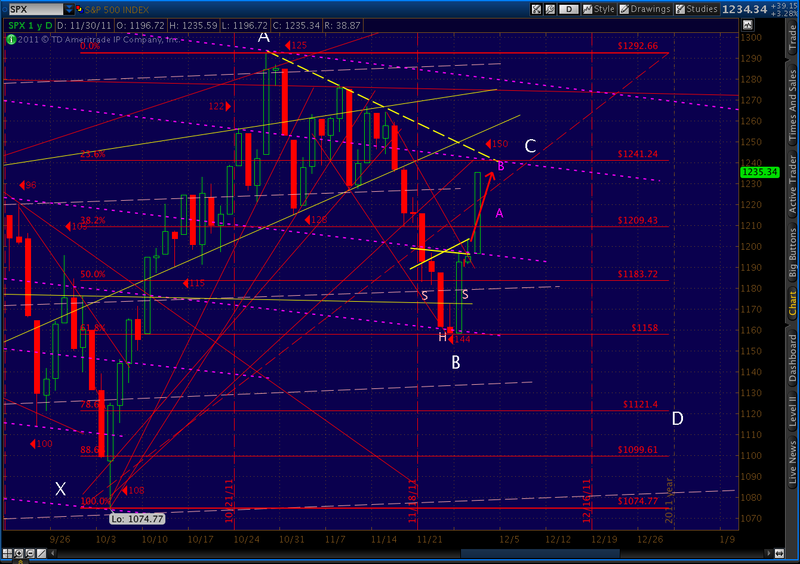 Here’s the same target, shown as small Point B on the daily chart. 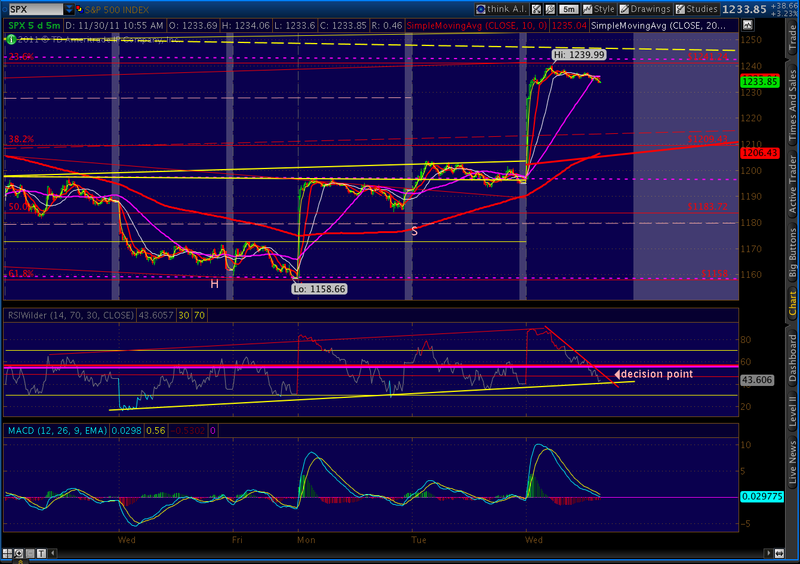 Small Point A shows the gap fill at 1209.43 — also the .382 Fib level. The trend lines on the RSI chart have done an excellent job of signalling reversals. Look at the chart below. 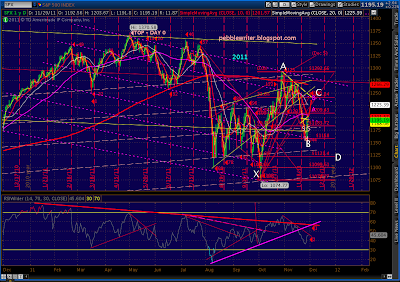 When the purple RSI TL was recently broken, it signaled the beginning of the 7-da7, 100+ point decline. It leaves us with a virtual fork in the road. 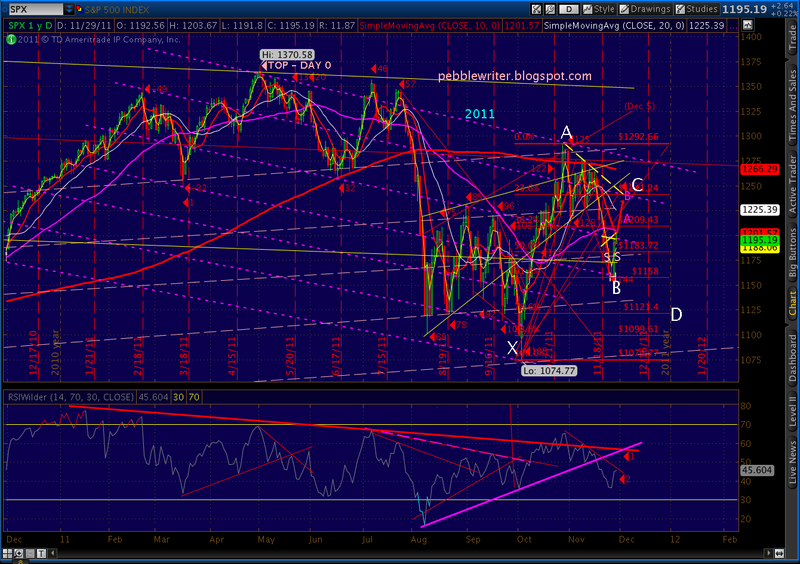 If we fail to clear the thin red TL at Point 2, the market heads back down. 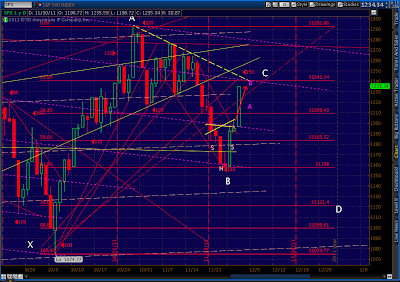 If we do break through, we could complete the back test of the purple line — thus allowing for a higher rally. A logical point for the back test is Point 1, which is the intersection of the purple TL with the primary overhead TL (since Jan 11) that’s signaled all the important tops in 2011. The 5-minute chart shows a similar approaching decision point. 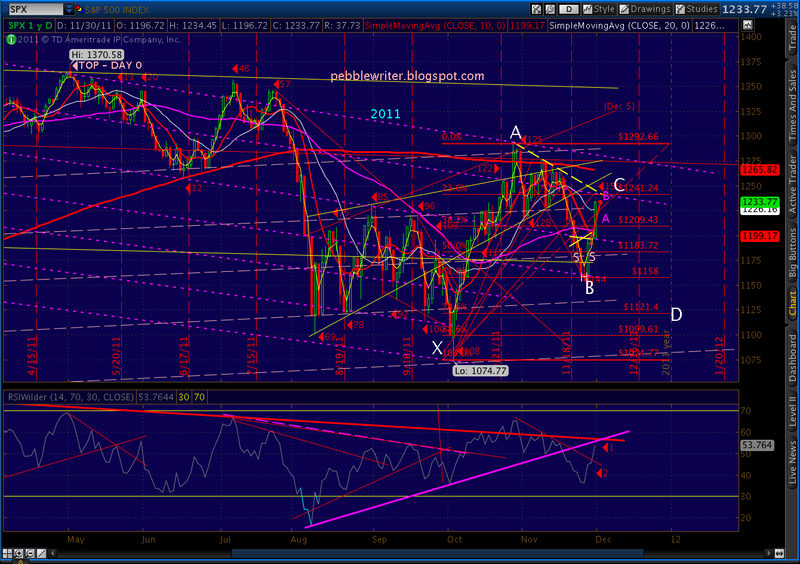 The longer term TL supporting a move up is about to intersect with a slightly shorter-term TL supporting a move down. 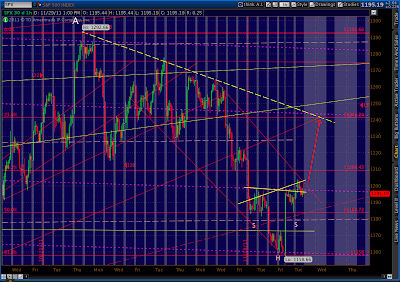 These “triangles” always signal a break out, one way or the other, and bear watching at every time frame intra-day. 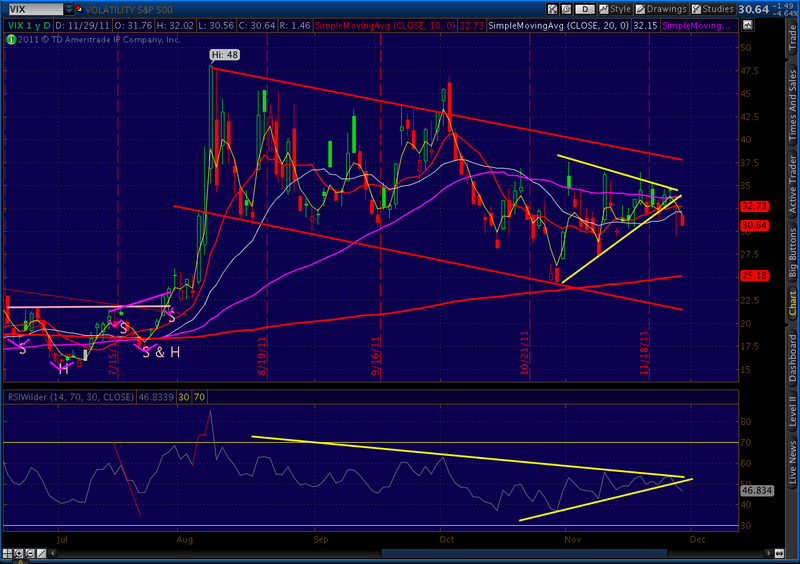 Another chart I’m watching is the VIX. 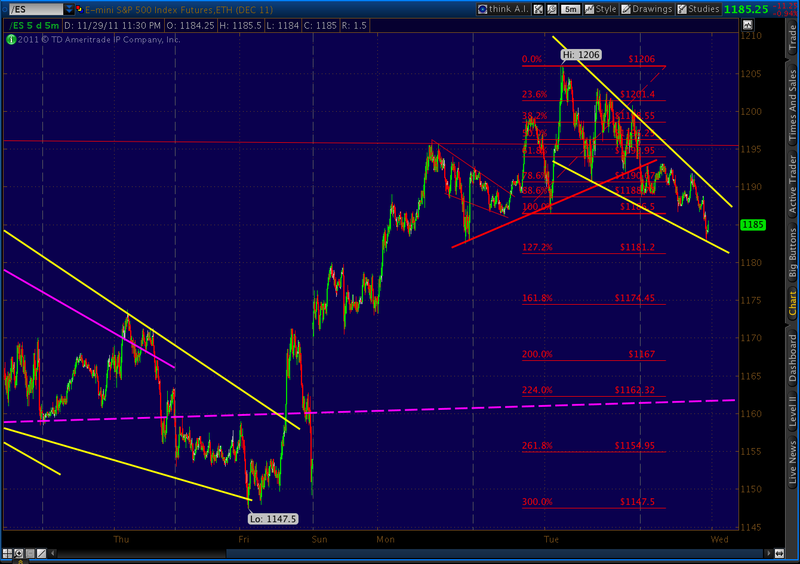 It broke down from a symmetrical triangle Monday, back tested the triangle, and fell throughout the day today. 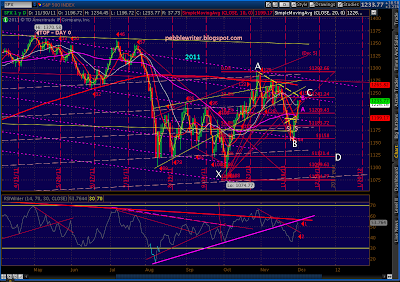 Its RSI TL’s reflect the “coiling” action of the triangle and the recent drop through support. Last, an interesting data point. 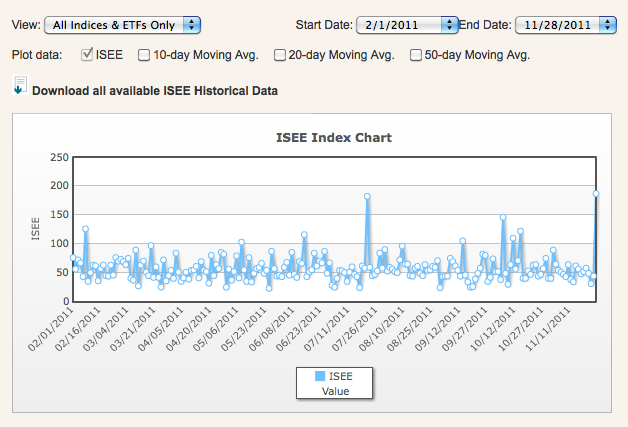 I try to keep an eye on sentiment, and was surprised to see today that the ISEE Sentiment Index set a new high for 2011. Today’s spike to 187 eclipsed the old 2011 high of 182 set on July 20 — two days before the start of the 250-point plunge to 1101. 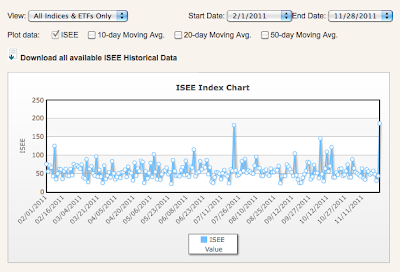 The ISEE Sentiment Index is unique in that it measures only opening long positions — a clear signal of bearishness or bullishness if there ever was one. I can only view this reading as a sign that we’re very close to the next plunge. Tonight’s action in the futures tends to signal the same, although we could be seeing a B wave, given that ES is also carving out a falling wedge. A reminder: Friday marks the 150th trading session since the May 2 high. In 2008, day 150 was the beginning of the end. GLTA.